When it comes time to perform maintenance and repairs on your vehicle, and you don’t know where to go or who to trust, Lenexa Automotive is here to provide the personal service and attention that will put your mind at ease. Since 1979, we’ve been specializing in repairs of domestic and foreign vehicles utilizing the latest hi-tech equipment and information. Our well-trained, ASE certified staff performs services that range from simple switches and oil changes to major engine overhauls, all at a fair price. 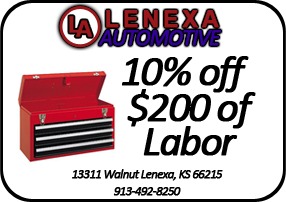 Lenexa Automotive is a NAPA Auto Care Program* representative, a privilege given only to shops that adhere to the industry’s strict guidelines. 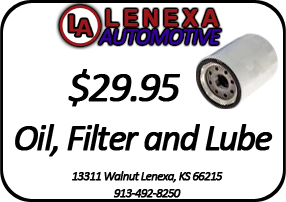 Our priority at Lenexa Automotive is to ensure that you, the customer, are informed about the services that we provide, and that you feel comfortable with the level and cost of services. Our customer satisfaction philosophy is to complete all NECESSARY repairs accurately the first time. We aim to make the entire process, from the drop off to pick up, as simple as possible. Lenexa Automotive has built a reputation on honesty and quality of work, which we believe reflects on the type of business we strive to be. Working together, we can add years to the life of your automobile.